A depressed divorcee named Adele (played by Kate Winslet) lives with her twelve-year-old son named Henry in a small New Hampshire town. Adele has emotional problems and rarely leaves the house. On Labor Day weekend in 1987, when Adele and Henry are out shopping, their lives change unexpectedly when they encounter an injured man named Frank (Josh Brolin). He is bleeding from a wound in his side and is limping. He approaches Henry first, and then Adele, and quietly insists that Adele give him a ride. She is naturally afraid of him but takes him to her home on the condition that he leaves at nightfall. Adele and Henry learn that Frank is an escaped convict, but the longer they are with him the more they realize they have nothing to fear from him. He was in the hospital for an appendectomy and jumped from a second-story window to escape. There is, of course, an intensive manhunt on for him. We (the audience) are told in little flashbacks what happened to Frank when he was younger that caused him to be in prison. (We are also told in flashbacks how Adele came to be so sad). Even though a convicted murderer, Frank is a good, kind person who knows how to bake pies and wax floors. When the time comes for him to leave, Adele doesn’t want him to go. After about a day, she and Frank are in love. It’s almost as if they were destined to be together. They both know that Frank will eventually be caught if he stays in New Hampshire, so they plan to take Henry and go across the border into Canada and disappear. We know the plan is not going to work out the way they want it to. Will there be bloodshed? 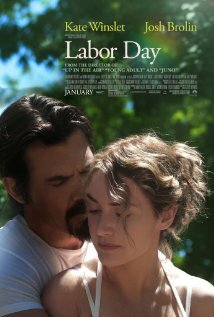 Labor Day is based on a novel by Joyce Maynard. It’s an old-fashioned kind of slice-of-life tear-jerker that is maybe skewed more toward female audiences. It’s entertaining in its way, though, with some good moments (the peach pie, the neighbor boy in the wheelchair, the small-town nosiness, Frank’s kindness). The ending seems a little sappy, rather like a TV movie, but it’s appropriate for the kind of movie it is. If you just wait long enough, things will straighten themselves out and you’ll get what you want, even though you might be too old to appreciate it.